#WatchInWatchOut – back by popular demand! 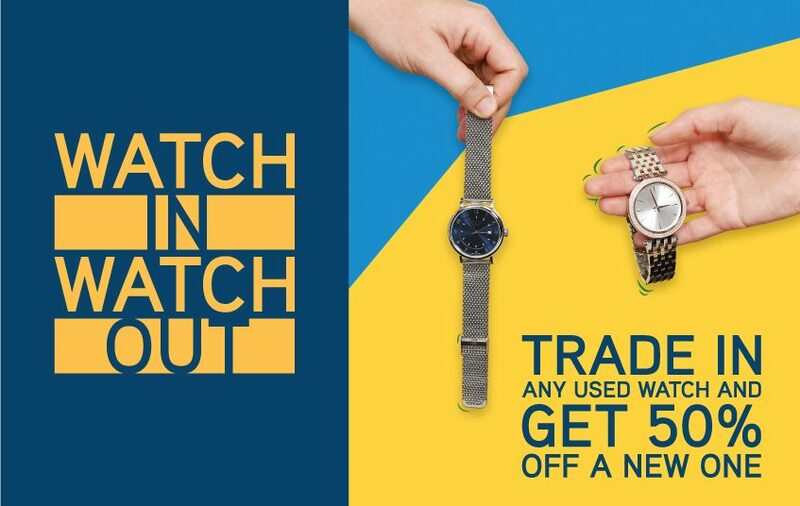 Upgrade your watch by trading in a used one at any 1915 by Seddiqi & Sons stores across the UAE and get 50% off a new one from 28th -30th March! – Trade In any watch and receive 50% off a new watch. – This promotion cannot be used in conjunction with any other offer. watch and that he has the full capacity and power to dispose of it. necessary by the condition of the trade-in watch. traded in by the same customer, which can be up to 3 per client. – Traded-in watches cannot be returned once the transaction is complete. accepted to be bound by them. – لا يسري هذا العرض في حال تزامنه مع أي عرض آخر. – يؤكد الزبون على أنه المالك الفعلي للساعة القديمة التي يود استبدالها ولديه. الصلاحية والقدرة الكاملة للتصرف بها. اقتناءها، الذي يصل عددها إلى 3 قطع كحد أقصى لكل زبون. – لا يمكن استرجاع الساعة القديمة بعد استبدالها وإتمام عملية الشراء. – يسري العرض على قطع مختارة. – تاريخ العرض: 28 مارس – 30 مارس.